It's adding cells in a fan gathering area in downtown San Francisco and will keep them after the game. Verizon vows to build the first 5G network in the U.S. Mobile use is growing so fast that cells added for a big event like the Super Bowl are now worth keeping just for daily life. Verizon Wireless is installing nearly 100 cells to make sure its network can handle the crush of a million or more fans around this year’s big game in the San Francisco Bay Area. Almost all will stay up after the game’s over. The volume of phone calls, selfies, social media posts and videos spikes around an event like the Super Bowl. Verizon expects its traffic to double next week in downtown San Francisco, where several city blocks will be closed to cars for a fan gathering area called Super Bowl City. Keeping up with that kind of demand forces carriers to plan ahead and get creative finding sites for their radios all over the urban landscape. 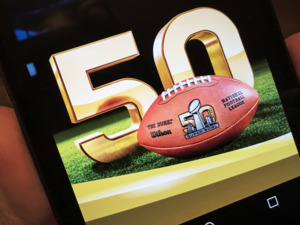 Verizon started scoping out its US$70 million Super Bowl strategy two years ago and began installations last year. Along the way, it was thinking all the way ahead to 5G, the next generation of mobile networks. In San Francisco alone, the carrier is installing 46 small cells and 10 traditional “macro” cells for the week of the game. One of those is a so-called COW, or cell on wheels, a tower that can be towed to different sites when demand spikes. It already looms near San Francisco Bay, next to COWs from AT&T and T-Mobile and just down the street from a Sprint mobile tower. In the Super Bowl City fan area in downtown San Francisco, seen on Jan. 27, 2016, there are three portable cell towers. From left: Verizon Wireless, AT&T and T-Mobile USA. The rest of Verizon’s new infrastructure downtown, spread throughout the area near the foot of Market Street, is permanent. Mobile traffic is growing faster in San Francisco than anywhere else in the West, according to Phillip French, executive director of networks for Verizon’s Western Territory. The tech boom, along with tourism, is driving it up. Verizon is struggling to keep up with the number of devices tuning into its network, he said. It wants eventually to install hundreds more small cells throughout San Francisco. To serve crowded places like San Francisco, carriers need to get low and close to users. Verizon has small cells only about a block apart in the Super Bowl City area. Some are on light poles and others hidden inside advertising kiosks along Market Street. Verizon wanted to put cells up on traffic lights and nearly 100-year-old historic lamp posts, but the city nixed those ideas. Other locations are cleverly hidden. On the outside of the Hyatt Regency hotel, only about 30 feet (10 meters) above the sidewalk, there’s a Verizon cell clad in a hard foam-like substance that matches the hotel’s 44-year-old concrete walls. New technology is helping Verizon’s stealthy rollout. For the past 18 months or so, it’s been using small cells that are stripped down to just an amplifier about a foot square and a separate antenna. All the other processing takes place in a central hub that can be as far as seven miles away. Verizon links the two with fiber. A Verizon Wireless small cell in San Francisco, seen on Jan. 27, 2016, uses C-RAN (cloud radio access network) technology. This C-RAN (cloud radio access network) is part of Verizon’s plan for 5G. It wants to be the first carrier in the U.S. to offer 5G and plans trials at its innovation centers in San Francisco and Waltham, Massachusetts, this year. The downtown buildout is paying off in performance, French said. In a standard speed test on Market Street next to one of Verizon’s small cells, his iPhone showed a download speed of more than 52Mbps (bits per second) and an upstream rate of almost 15Mbps. That was in early afternoon, the busiest time on the network in San Francisco, according to French. A Verizon Wireless speed test in downtown San Francisco on Jan. 27, 2016, shows the performance of a network bolstered to accommodate Super Bowl fan activity.